Brides.com- Winter Weddings Story (We're Featured)! I just got the link to a story on Brides.com entitled “Winter Weddings” which features two of our pieces the Eden Song Hair Ornament and the Stardust Vine. What a wonderful story showing many snow inspired, sparkling, & glittery hair accessories! 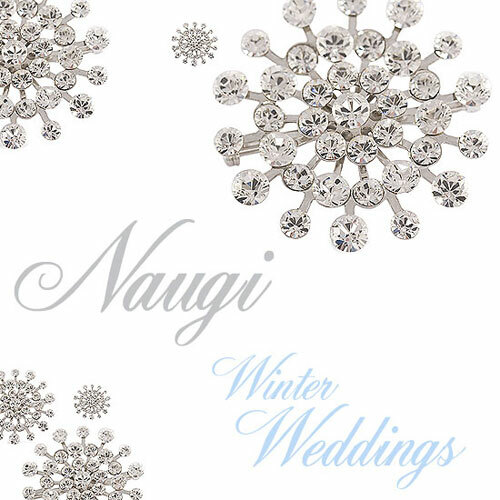 A winter wedding can be an opportunity to play on the lush imagery of wintry white snow, glittering and slowly falling snow flakes, and smooth reflective ice. Shades of white, icy blue tones, soft smokey grays, and silver are some of my favorite colors and perfect for a winter wedding theme. Last winter I worked with a customer who got married 3 days after Christmas. Why? Well, her fiance is in the military and was scheduled to be home on leave then. It was actually my neighbor’s very good friend so I loved helping her!! I literally loaded about 30 items in a box, gave some suggestions, and gave them to my neighbor for her and her friend to go through. So much fun! In the end she wore the Sugar Plum Headpiece and pinned 2 Lola Brooches (pictured in the image above) clustered together on the hip of her gown. I’m always happy to help if you have a specific theme you’re working with or even just have some ideas you want to run past me. Some of the best results come when there’s a back and forth exchange of ideas!